The following are responses from surveys given to classroom leaders and volunteers OR responses we have gotten via e-mail after churches began using the Chirp Curriculum. We are blessed to hear such great things happening in so many classrooms! * Have you seen new things from your students that you didn't see before? "Even students who I could accurately predict would NOT participate in the activity accompanying the lesson - are participating! YAY." "[Students] seem more engaged & likely to respond." "[Students] are praying. They are participating more & paying better attention during story." * Have you seen a change in the level of interest, participation, or comprehension from your students? "Less distractions and more desire to hear story. More initiative to participate in crafts." "Yes, in many ways. They are more engaged and seem to really be getting it." * How has the curriculum affected you as a leader/volunteer? "It is easy to deliver and very organized and concise." "It is more fun to do when the kids are more responsive, which makes the whole process more fun to do and be part of." "It has made it easier to 'get to' the kids - it's more kid-friendly, which makes it easier to teach, leaving more quality time for other interactive extensions of the lessons." "I find it easier to discuss with the children what we learned." * What do you think is the most helpful part of the curriculum? "Short, pictures, and it's participatory." "The simple language and direct relationship to their individual level (the language they understand." "The foundational basis that it is building for these kids - that God loves them, He is always there no matter what." * After consultation, team brainstorming, and training with Christie about their struggling special needs program, this church decided to begin using the Chirp Curriculum in their classrooms. A couple of months later, a volunteer in the program wrote to tell us how much the Chirp Curriculum had changed their program and her feelings about being part of the team. The way she describes the teacher modelling things for students is explicitly written into the lesson - the teacher did not have to TRY to be more creative and interactive; she was just following the curriculum! (Some details of this e-mail have been edited to remove identifying information and for clarity). ". . . the kids responded much better. AND [the teacher leading the Chirp lesson] had them at the table working on things while she talked and asked them questions (and had them repeat things like God loves them when you're happy, then again after learning He loves them when they are sad - angry etc). Some really participated and some just did the project (which was great). She had them make the face expressions of happy/sad/etc too and some did and some didn't… but it was well received. As for the craft… [our sensory kids] loved the yarn a lot. Anyway, the point is, even students who have autism and are very much in their own world who didn't previously answer questions or repeat statements and such… they got it!!! About 15 minutes later we were playing and [one previously disengaged student] laughed and said 'sad' then showed me sad face and he cracked up laughing. He did it about 3 times. It was so adorable. 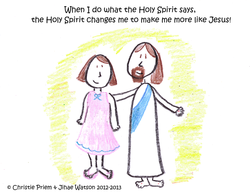 I LOVE THIS NEW WAY OF WORKING WITH THE KIDS to teach them about God. It works for ALL of them regardless of their disability. It was great. I just wanted to say thank you. " * "The curriculum has been amazing, the students seem to be thriving and learning more about God's love through the pages you have created. We treasure your prayers and my volunteers can not thank you enough for helping them feel more equipped to lead their classes." * "Our newest story is of a little boy with Downs. He never participates. We still can’t get him to the table, but last Sunday he decided to jump the verse on the markers on the ground. He does not have great vocabulary skills, but he jumped it twice. He then went over to the prayer board and just pointed at all the different prayer cards on our magnet board. We didn’t join him or he would have bolted but it is clear he has been observing and it has made an impression! Thank you again! We are reaching our kids!!" * "As a teaching staff we love it. We have noticed more involvement and participation with our students since using this. One of our volunteers made the comment that since using Chirp it is the first time she really feels like she is connecting with some of the students." * From a viewer of the Chirp YouTube channel: "Oh my goodness! Where to even begin... The last few weeks, honestly years, have been extremely difficult, my son has sensory processing disorder and has been defiant and angry and having meltdowns and tantrums about literally everything. I love him so much but I honestly didn't know what to do and was so very lost. Anyway, I said a prayer yesterday afternoon asking for help, and last night I stumbled across your episodes. I find you very relatable and I can understand what you give examples of so well, I just had to let you know how much I appreciate the effort you have put into making these videos available! Thank you again so much, you have given me some new direction, strategies to try, and hope for our family. I am so grateful and have been trying to soak up all the information, so helpful. I look forward to watching more of your videos!"